1989 was the year that the Rothsteins took to the hills. While Toronto was left to its frenetic urban weekends, the family of five drove a mere one-hour North . . . and escaped. 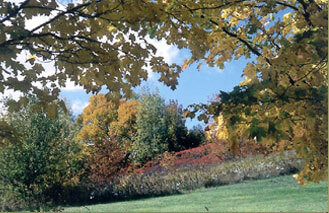 Cedar Creek Farm is a 17-acre property located in the Caledon Hills. It became a quiet and beautiful retreat for the whole Rothstein brood, but especially for Marty and Marsha. The gently rolling hills and golden light encouraged snoozing, eating, and slow country walks. Over the years, such placid Saturdays and Sundays turned into grand expeditions: They explored the surrounding communities, the restaurants, country fairs, artists' galleries and regional playhouses. There was much more to do in the country than contemplate the rustling leaves.